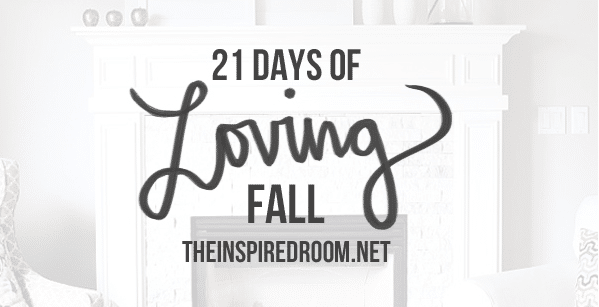 One of my goals every fall is to get more organized in hopes of more fully enjoying the holiday season. I usually get on a decluttering rampage and crave more order all over the house before I can even *think* about Christmas! Way back in January of this year I set a few organizational goals for our house. The idea was to consider each room and how I could create more functional and attractive storage all through the house, whether it was through adding new free standing cabinets, built ins or simply reorganizing and beautifying closets or cabinets. I wasn’t sure exactly how all that new storage or better organization would come about, I just knew I wanted every room to feel cozier with just the right furniture. I was determined to make the most of the space I have. I’ve kept this goal in mind all year as I window shopped, always keeping an eye out for what I might be able to use in various rooms in my house. My dream for our dining room has been to be really organized with hospitality items like cloth napkins and napkin rings, candles, drink charms, serving items and things like that for entertaining. But with a pretty small space, it took some patience and thought! I love the idea of having several designated storage pieces for specific purposes, rather than cramming everything into the kitchen in too high to reach or overstuffed cabinets. I love to have breathing room and to have everything easily accessible. There is no reason why every room can’t have functional storage. While I have found other creative spots around the house to keep things I use for the dining room (the dresser in our entry, for instance), recently I was able to find an additional couple of small scale cabinets that could fit right in my dining room and yet would still leave plenty of room for sitting around the table. I wasn’t sure I would ever find the right pieces because our dining room is so small and it can feel too cramped so easily! I was also picky about what I was looking for. 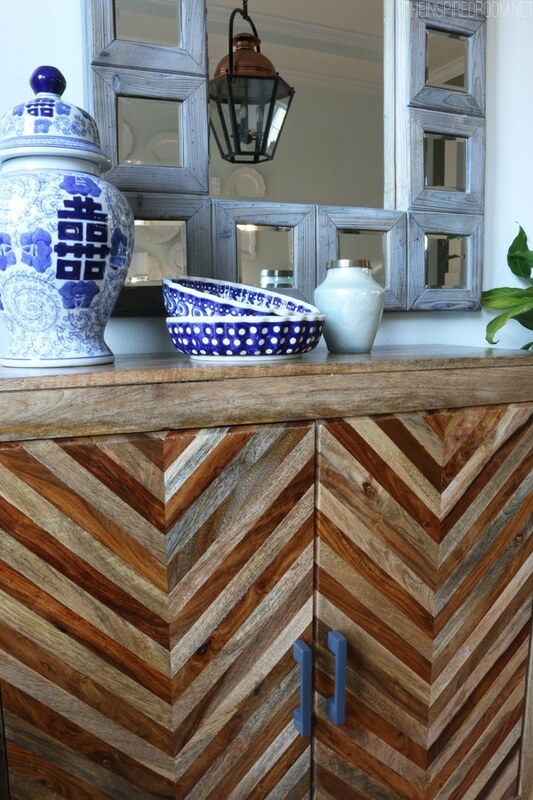 Earlier this year I had ruled out just about every buffet and console table I had ever seen because most of them were too deep or felt too bulky for our dining room. I finally decided I was happy just using our rolling cart for a serving surface because it is a little more airy. But for the other side of the dining room on the shorter wall, I imagined squeezing in something really shallow but also something very sturdy and easy to get into. There is very little space leftover after you sit in the chairs at the table and I didn’t have to wrestle with drawers that didn’t open easily, or risk injuring a guest if I had to tug open a cabinet in a tight squeeze, or anything else that cause frustration in a small space :). I think if you live in a small house or just happen to have small rooms, it’s good to consider your emotional health and tolerance for frustration when buying furniture (heheh.) When difficult to manage storage collides with people and small spaces, things could get ugly. 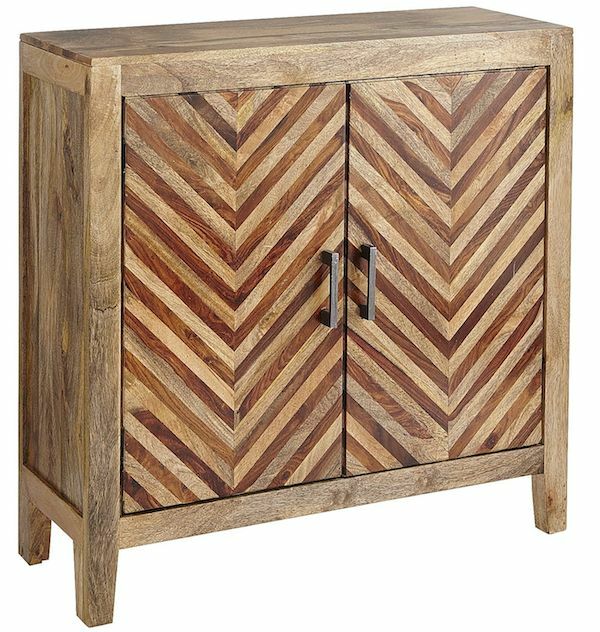 When I was buzzing through a few shops, I stopped in my tracks and did a double take when I saw this small stylish rustic handcrafted cabinet (I used my designer discount. You can find it here). It was not only a striking piece of furniture, it was the perfect size for our small dining room wall. I loved the gorgeous wood tones in a beautiful patterned mix of gray and neutral that I knew would beautifully complement our Hickory flooring. When I opened the cabinet doors, I was THRILLED. Not only was it shallow, but it was the sturdiest cabinet I had seen in awhile. It had ample space inside on the shelves and two drawers for whatever I might want to store in it. It also seemed like a very versatile piece that could be useful in a variety of rooms. It’s always nice to have flexible pieces so you can rearrange your house or move and still use what you have. I haven’t yet decided everything I will store in it, but I’m really excited to have another place to get organized for hospitality! I can’t wait to get even more organized in the coming months and decide what will go where. I have made quite a bit of progress this year in creating functional storage for each room on our main floor, so now I can start to come up with a plan for what is best suited to keep in each space. You can see how the house has been coming together all year long as we have added an eclectic variety of storage pieces (everything from flea market finds to Restoration Hardware cabinets!) to each room of the main floor: the flea market entry dresser here, the gathering room cabinet in this post, and the new family room cabinet here and the new office furniture and repurposed secretary desk and hutch here and the second hand rattan shelving here. I haven’t yet styled the wall or rehung the mirror since I just brought the cabinet home this week, but it sure is fun to have something new to organize and enjoy! And it’s always fun to have a few new surfaces for some of my favorite things :). This other small rustic cabinet I picked up at HomeGoods over the summer sits in a formerly unused corner of the dining room. It is currently holding our napkin rings, chalkboard labels, place card holders, wine charms and wine glasses. Both of the new cabinets are really shallow and fit perfectly, which makes them useful without taking up excessive amounts of floor space. It’s amazing how much useful storage you can tuck into a small room if you can find the right scale of furniture for the space. I am finally feeling like my main floor is coming together with practical and useful furniture in every room. I’m excited to have this new piece just in time for fall and Thanksgiving entertaining! 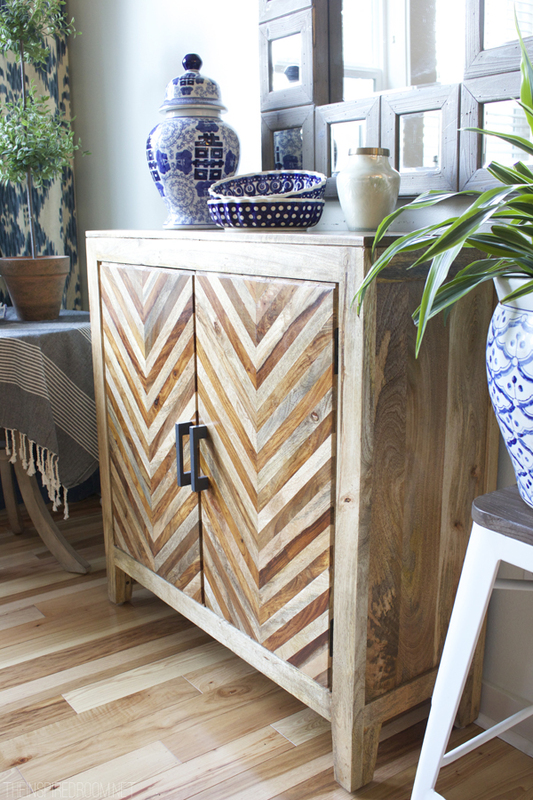 Do you have room for a china cabinet or buffet in your dining room? 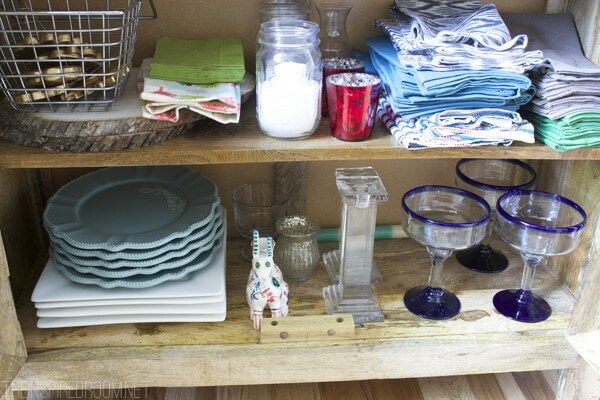 Or where do you store your entertaining supplies? Hi Melissa! I noticed recently I no longer receive your posts in my inbox. I have checked my spam and they are not there either, Tried signing up on your homepage and it said I should receive a confirmation in my inbox, but I do not . Now in order to see your posts I have to search under the inspired room. Has anyone else encountered this situation? I LOVE your blog!!! Thanks for letting me know, Alison! We just discovered that no one has gotten my emails since the end of October! How crazy is that? We are working on finding a solution now. I’m glad you could still find me :-), I was getting lonely around here! Hopefully the issue will be resolved soon. Thanks so great! I love how you repurposed that cabinet to better suit your needs right now. It stores so much, that’s awesome! Thanks for sharing :). Melissa, I’m with Alison. Been crazy busy but just realized this morning I hadn’t received anything in a while. Went back and checked my junk mail and nothing there. The last post I got was 10/28. I’ve just subscribed again and it said I’d get a response too but so far nothing. The cabinet above is beautiful but I’ll reserve comments until I catch up – got a lot to read. Let me back in, please – you’re blog is an important part of my days and a big source of inspiration for what I’m doing in my home. Thanks for letting me know! I’ve been hearing this from people here and there but finally realized NO ONE was getting the emails! We’ve discovered that my posts haven’t been going out to anyone ALL MONTH! No wonder I was feeling lonely around here! Glad you persevered and still know where to find me :-). My code person is working on it with the email service people now and hope to get things back up and running again soon. I actually have 2 tall cabinets with baskets that pretty much hold my kitchen linens, oh yeah and one full of crayons in my dining room. It wouldn’t be normal around here if something didn’t contain an item of the kids! I have a goal to be organized but sometimes in life’s busy shuffle they seem to get unorganized, putting it mildly. But usually after the holidays I do a thorough cleaning/ reorganizing. I, too, have small rooms and I know exactly what you mean about finding shallow pieces. You need to wait and hold out for storage that will not eat up too much space in the room or you will regret it. I recently found a similar piece at TJMaxx. It is dark-stained acacia wood and sturdy. 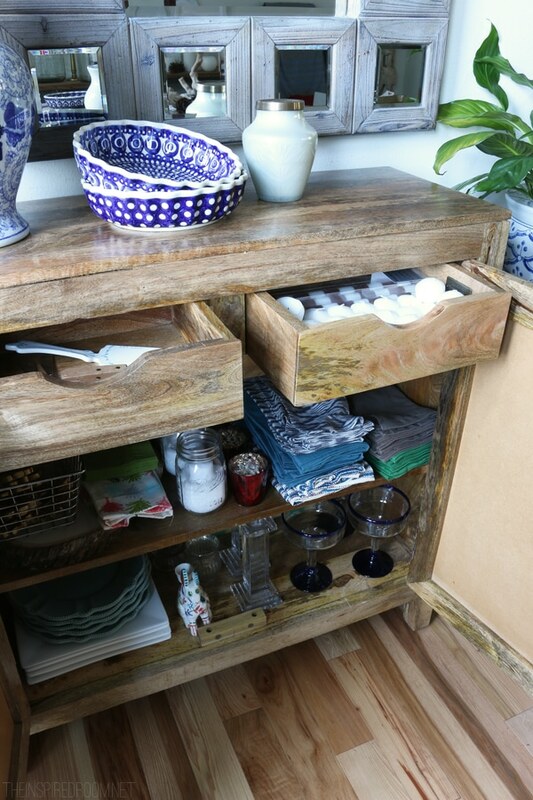 One drawer, to small doors to shelving underneath. I LOVE it as it holds some important kitchen items like my cookbooks and my cast iron enamelware, but it has a very slim overall footprint. Win-win! I love all your pretty and practical new storage furniture! It’s been a good year for your house! Thanks Helene, yes, it is always worth it to wait for the right pieces. And it has been a good year for my house, getting all fixed up with these new cabinets. It’s been fun to be at this stage of considering those details, finally :-)!! I really love this chest. It is so unique, I want one too! The storage is great. I also live in a small space and have to use my space so wisely. This gives me some more ideas on things I can store in more useful spaces! I love your style and your blog! Melissa, you really surprised me with the cabinet and its style. That’s a good thing! I don’t think we should ever be too predictable in our decor. I’ll look forward to seeing a room shot at a later time. Christmas maybe? I’m so excited that your post arrived in my inbox today. I’ve been meaning to tell you…but time whooshes by so quickly and I know I’ve missed posts even though I’ve picked up a few via social media. It looks like lots of other gals have missed you too. Hope it’s an easy solution. Thanks Diane, I hope it gets resolved, too! Crazy. And yes, the cabinet helps pull together so much in my house even though it is a unique piece. It ties together the copper lantern and the warm floors so wonderfully, it feels like it was made for my house. It’s funny how the white walls in there basically BEG for warmth for balance and this cabinet was exactly what the room needed to finish it off. It’s nice too that it has it’s own personality, that makes me happy :). I guess that’s why I decorate so slowly (besides being on a budget heheh), I am happier when I wait until the right pieces come along that can complement the decor and fit with my needs, rather than getting stuck in a predictable formula that will bore me over time. I know, I’m a little crazy like that. looks just so cozy and lovely. Pier One comes through! Great design too and functional. Win/Win! This is Unrelated but IS related to storage. I’ve tried so many strategies for keeping our KitchenAid mixer handy, incl getting a rolling cart and storing it in the pantry to roll out as needed. But I used it less. So I liberated it and put it back on my kitchen counter (and I like a tidy kitchen with few appliances out). But I still had to pull it out from the back of the counter to use it and that about killed my back. Those mixers way a ton. So I discovered the Handy Caddy Sliding Counter Tray on Amazon for under $10 and it works like a charm. Love it! But then my white classic and old KitchenAid mixer died. What? So I got a good sale on a new one and decided to get one in the color persimmon and it’s a lovely and jazzy pop of color. Don’t mind it sitting out on the counter whatsoever now. Thought I would share that KitchenAid storage idea should anyone have a similar problem. I have a smaller dining room 11×13′, and since I used to live in a large, Victorian, I have a beautiful walnut buffet and china cabinet. I keep my Wedgewood china and various decor pcs. In the buffet. And my collection of Royal Albert china mugs and crystal goblets,glassware and table linens in the cabinet. I love the fact that I can dress up the buffet like a mantle, changing the “tablescape” with the seasons. Both of these pcs. aren’t terribly deep so they fit well into this room. You nailed it! 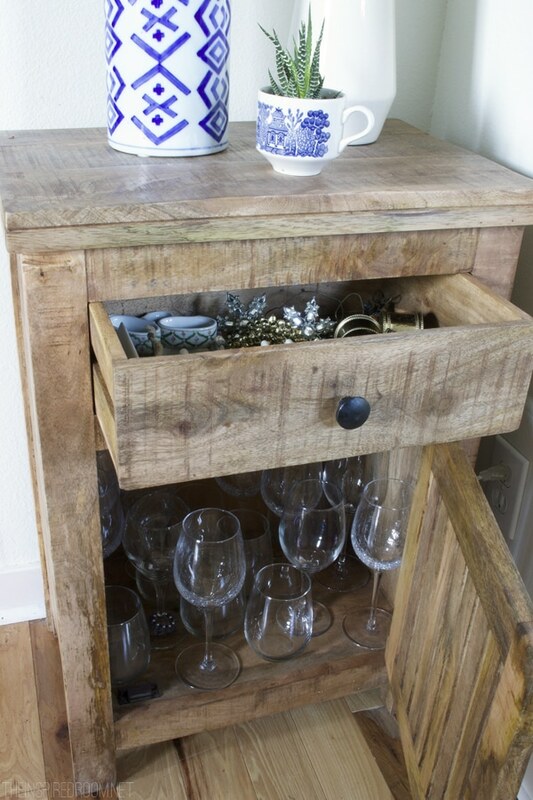 That is such a nice little cabinet…functional and very interesting to look at. The wood pattern on the front is striking. I noticed I wasn’t receiving my daily emails and wondered what happened. So glad the problem was discovered and fixed. I enjoy your posts. I love both of those cabinets!! great finds!! Wish I had the space for them in my house! Is there a way for people to share photos of what they’ve found in storage solutions? Liked some of the ideas here and pics would’ve helped. Thanks!